According to a recent survey, 80% of employees would like to see more recycling in their workplace and 71% of people said that having access to recycling facilities at work makes or would make them feel like they work for a responsible employer. One business tackling recycling and waste reduction head-on is Express Data Holdings, an ICT distribution company in the ACT constantly looking for ways to improve its business practices. "Our motivation for participating was driven by our desire to increase our environmental credentials and also to drive down costs," Clint Musgrave, Compliance Manager at Express Data Holdings. "We noticed that our skip bins were costing us a considerable amount of money to remove waste." With these aims in mind, the company's primary action was to monitor the types of items going into its office bins and skip bins each day. The office bins run on a communal system and all bins are sorted between general waste, paper and comingle recycling. As a distribution business, there is also a large volume of cardboard packaging coming in and out. 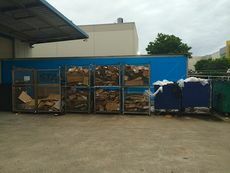 The monitoring activity showed that the skip bins were full of a large amount of recycling, particularly cardboard, which was being diverted to skip bins because the cardboard collection wasn't large enough. "The end result for us was to increase our cardboard collection facilities by a factor of six," explained Mr Musgrave. "We also increased the frequency of collection. The company that we use provided the additional collection facilities at no cost. We were then able to remove two of six skip bins on site, reducing waste collection fees by over 30%. We may even be able to remove another skip bin shortly, taking our savings to 50%." The additional collections facilities on site have also sparked behaviour change, as the staff is now more mindful of separating cardboard, e-waste and other recyclable materials out of general waste.